About My Car: Purchased in 2001, pretty much in the condition it is currently in. 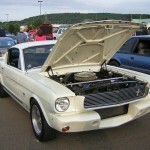 This Mustang was restored in the late 1980’s by a friend I had known from my teenage years. It was born a T-code automatic with A/C (secretaries car). Starting with a nearly rust free PA car, the car was converted to a mildly built 289 with Ford toploader 4-speed and Hurst shifter. Lincoln Versailles 9″ limited slip rear end with disc brakes. Ford Granada disc brakes retrofitted up front as well. The suspension has been upgraded with Global West upper and lower control arms, 1″ (Shelby) front sway bar, 620 lb front springs, upper control arms relocated per Shelby specs, Gabriel shocks all four corners, reversed eye rear leafs, etc. Black interior with Pro-Car front seats and 3″ Shelby lap belts. 15″ x 7″ American Racing Torque Thrust “D” rims with Goodyear 215-60-15 VR tires. I added the Shelby “R-model” fiberglass front apron in place of the front bumper and splash pan. Bodywork and paintwork was done during restoration in original Wimbledon White; base coat / clear coat. I drive it only occasionally; it’s a handful without power brakes or power steering, but when the 289 winds out, it provides a reminder of what made Ford so dominate in racing in the 1960’s with their Cobras and Shelby GT-350’s. 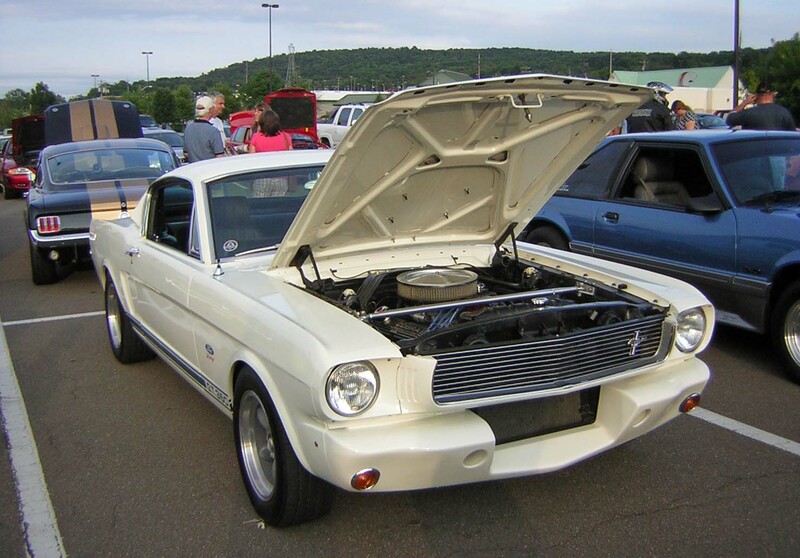 People who drive their new performance Mustangs have no idea how far technology has brought these cars from the ’60’s and 70’s. 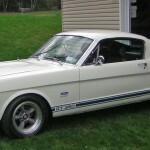 I’ve lusted after ’65 – ’66 Shelby Mustang GT-350’s since I was a kid. 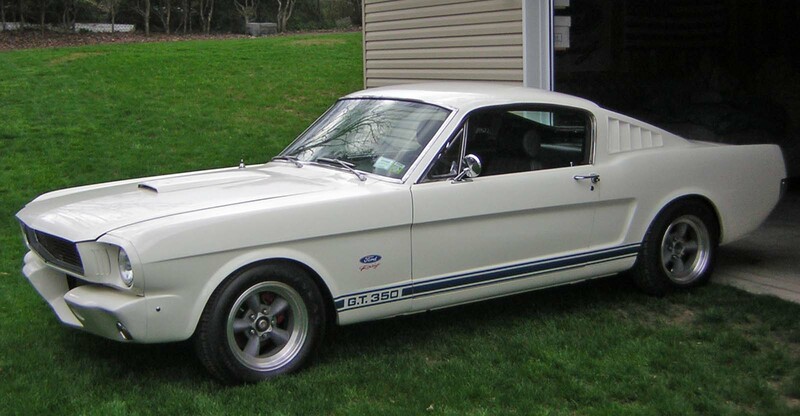 Although I’ll never own the real thing since they are now valued at $125K and above, my ’66 fastback is close enough for me – it’s 95% of an original GT-350 without the serial number, pedigree, or outrageous price tag.